Note: This adapter does NOT Convert Voltage. Make sure your device with input voltage range 100-250V before using the adapter to avoid possible damage to your device. This compact adapter is very suitable for overseas business or travel. A standard North American 2 or 3-prong flat pin and 2 USB ports support charging electronics such as iPhone, iPad, Camera, Tablet, MP3, Bluetooth Speaker and other device. 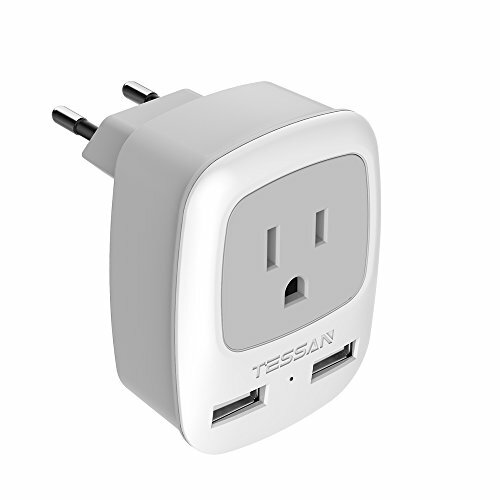 Type C plug adapter is used in over 80 countries around the world. Compatible in most European countries. Compatible Countries:Armenia, Austria, Azerbaijan, Belarus, Belgium, Bulgaria, Croatia, Cameroon, the Czech Republic, Denmark, Estonia, Finland, France, Georgia, Germany, Greece, Hungary, Italy, Kazakhstan, Kyrgyzstan, Latvia, Lithuania, Luxembourg, Macedonia, Moldova, Monaco, Mauritius, the Netherlands, Norway, Poland, Portugal, Paraguay, Romania, Russia, Ukraine, Serbia, Slovakia, Slovenia, Spain, Sweden, Switzerland, Bahrain, Chad, Egypt, the Republic of Guinea, Israel, Iran, Iraq, Jordan, Kuwait, Lebanon, Madeira, Mozambique, Niger, Oman, Palestine, Saudi Arabia, Syria, Senegal, Turkey, Aruba, Bolivia, Bonaire, Brazil, Chile, Peru, Saba, Suriname, Uruguay Bangladesh, Indonesia, Korea, Vietnam, etc.